DESIGN 101: WINDOW TREATMENTS - SHADES, BLINDS, AND SHUTTERS! Design 101 this month is all about windows! Last week we posted everything you need to know about drapery styles. Drapery isn't always the best answer for your windows (more on how to choose your style coming up soon!). Sometimes shades, blinds, or shutters will do just fine. Sometimes you'll even want a combination of the two! Below are some guidelines to help you choose shades, blinds, and shutters. 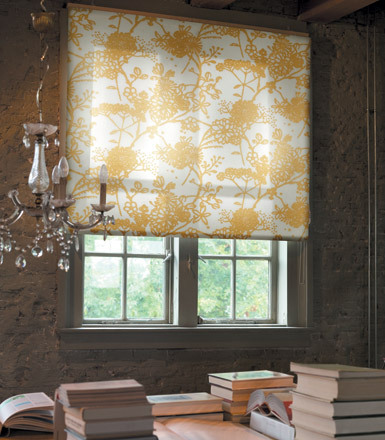 Like with drapery, there are a number of options for fabric shades. Below are our favorites. 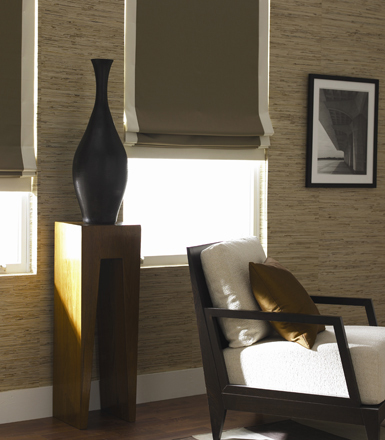 Flat Roman Shades are popular for a tailored and contemporary look. We like these for any room in the house where you want something clean and functional for everyday use. Relaxed Roman Shades are a bit more traditional. They have a gentle curve at the bottom, referred to as "unconstructed". If you have wide windows, there will be more than one scoop. We love this look using sheers to add softness to the windows, or for a room where you won't be raising and lowering the shades everyday. Any shade, such as this Tulip Roman Shade with a swag at the bottom, is very traditional. Typically, inverted pleats are fabricated at the top and the bottom of the shade, offering a fancy detail. We think this shade looks great in a special setting, like a formal dining room, where you might want to add a decorative detail to the windows but won't be raising and lowering the shades everyday. If you're looking for a shade that is simple and architectural, a Roller Shade can often be the way to go. Below are our "go-to" roller shade favorites. Solar Shades are a great modern option if you want to block UV rays and stay energy efficient, but privacy isn't an issue. Typically, solar shade material comes in a range of weave depending on how much light filtering and privacy you need. A tighter weave will offer more privacy, while a more open weave will allow you to better maintain your view. A Roller Shade can be fabric too! Although typically a sturdier material, roller shades are available in a range of materials and patterns, depending on the aesthetic you are trying to achieve. We like using fabric roller shades in no-fuss areas like kid's rooms. If you want to bring nature in, Natural Fiber Shades can be a great way to do so. Below are our favorite styles and materials. 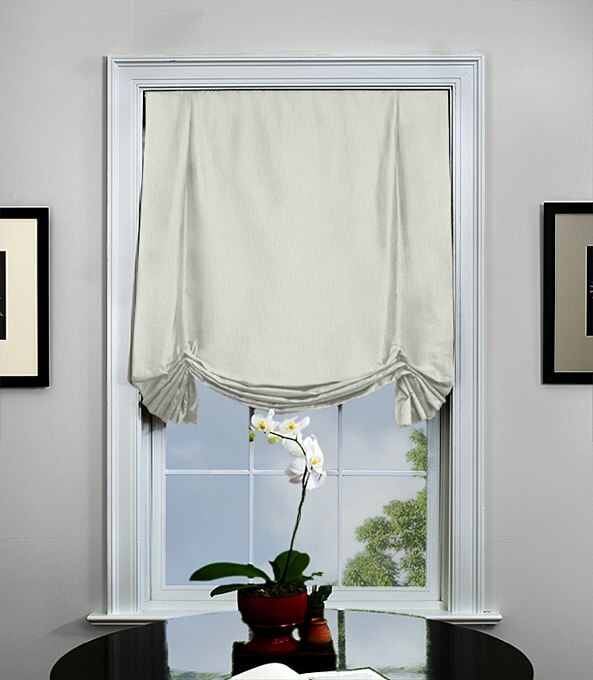 A Natural Fiber Shade can be fabricated so that it acts very much like a Roman Shade, with a waterfall detail so that the material neatly folds as it is raised and lowered. We like the tape trim on this one to give a tailored look to a more rustic material. A Top Down / Bottom Up Shade can be a good option for a Natural Fiber Shade as it allows you to maintain privacy, but also let light in. 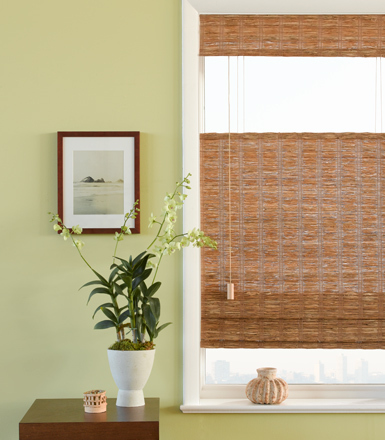 Natural Fiber Shades are available in materials such as grass, bamboo, and paper. Wood blinds are both functional and terrific for light filtering. They come in a variety of materials and finishes that offer both aesthetic and maintenance flexibility. 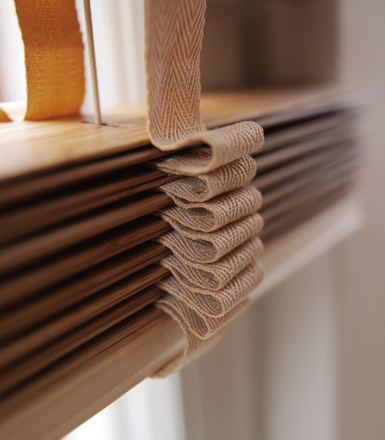 We like a traditional approach to wood blinds as shown below. Wood Blinds are a great fit for areas that need regular cleaning, like a kitchen, as they can easily be wiped down. If you're worried about mildew in a bathroom, try using faux wood blinds. We like to add contrast tape to our Wood Blinds to give them a more tailored and customized look. Shutters are another no-fuss and architectrual way to treat windows. They are easy to clean and terrific for light filtering. 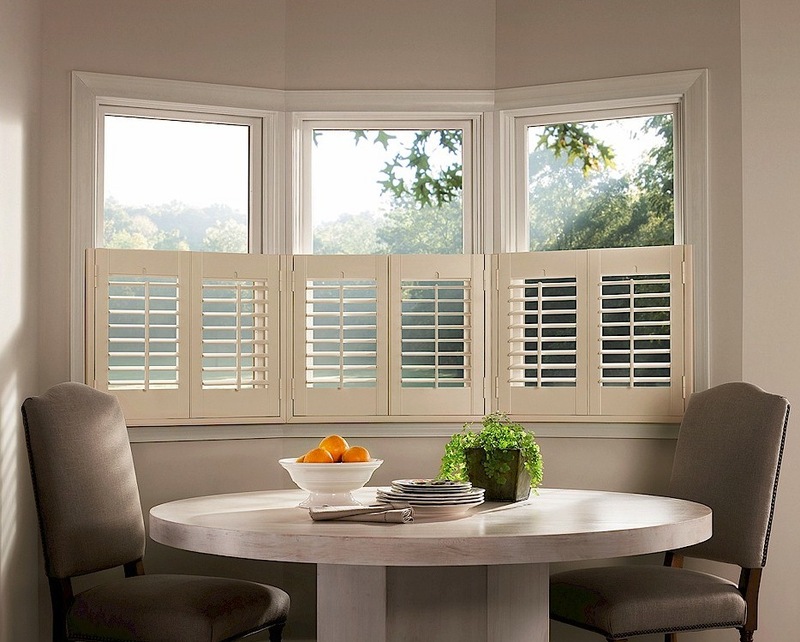 We often combine shutters with another window treatment to give both a functional and soft window solution. Below is some of our favorite Shutter inspiration from Hunter Douglas. We like to add a Fabric Roman Shade over Cafe Shutters to offer a cozy look and additional privacy and light filtering. We like to add Drapery to full height Shutters to add softness and a complete blackout affect. All of the shade images we used for this post came from The Shade Store, who offer a wide range of fabrics and styles for your windows. We love them because they offer a semi-custom product at terrific prices. If you have a window question that we haven't addressed, send us an email! We love to hear from you! Next up: Fabrics and Window Treatment Details!